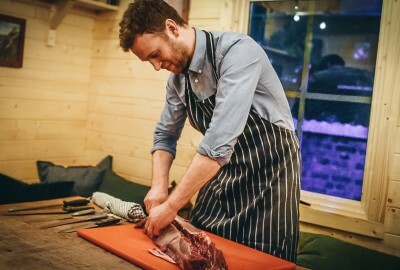 Learn the art of Venison Butchery through an interactive hands on experience at our Devonshire Square Restaurant. Guests will learn how to remove the tenderloin and striploin from the saddle of the Venison. Each couple will receive their own saddle of venison, broken down by them, to take home. Please note: venison is generally available all year round but there may be occasions where we cannot get our hands on any. In such circumstances we will use a different meat or can notify you as soon as venison is available again. What you will learn: -	Basic butchery skills. -	How to breakdown a saddle of venison. -	How to larder trim venison striploin. -	Advice on cooking the meat. Take home. -	Larder trim striploin -	Tenderloin -	Bones to make beautiful stock. Butchery classes run most Wednesday evenings at 7pm at our Devonshire Square restaurant. Not valid in conjunction with any other offer. Valid from 3/1/19. Butchery classes run most Wednesdays at our Devonshire Square Restaurant at 7pm. Vouchers can be redeemed for reservations on these weekly classes subject to availability. Alternative dates may be considered but cannot be guaranteed. Terms & conditions apply.